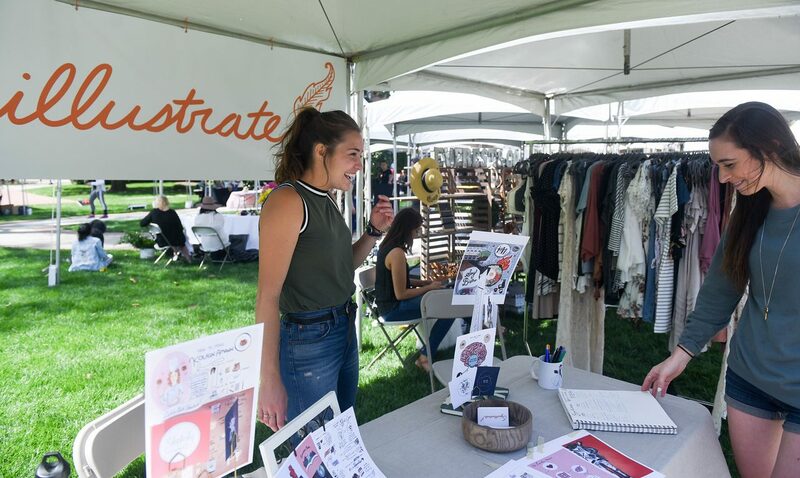 Then senior Suzanna Stapler shows off the products of her company Squillustrate at Belmont’s annual Entrepreneurship Village event in May 2018. Belmont University offers one of the best programs for students aspiring to launch their own businesses according to The Princeton Review. The education services company named the school No. 24 on its list of “Top 25 Undergraduate Schools for Entrepreneurship of 2019.” Belmont represented the only school in Tennessee, and one of only three colleges in the Southeast, to be named to the list. 2015 music business graduate Joseph Pillatsch displays his Nashville Sound Panels at the 2018 Entrepreneurship Village event on campus. Typically, around a third of the Belmont students concentrating in entrepreneurship create businesses that are their main or sole source of income immediately following graduation. In recent years alumni have created a variety of different businesses, including Internet marketing, photography and design, audio/video production, catering/food service and fashion. One example is 2013 entrepreneurship graduate Jonathan Murrell who started the Escape Game, a business which can now be found in eight cities around the country with plans to expand into 14 more. Sarah Worley, another local success story, received her B.S. and MAcc from Belmont’s Massey College of Business before starting Biscuit Love, a popular destination with three locations in the Nashville area. Senior Austin Sellinger showcased an app he co-founded, Style12, which matches users with freelance hairstylists in their area. Princeton Review tallied its lists of top 25 undergraduate and top 25 graduate schools based on a survey it conducted from June through August 2018. Out of more than 300 schools offering entrepreneurship studies that The Princeton Review surveyed, 38 institutions’ undergraduate and/or graduate programs made the roster of top schools for 2019. The 60-question survey asked schools to report on levels of their commitment to entrepreneurship studies inside and outside the classroom. More than 40 data points were analyzed for the tally to determine the rankings. Information about The Princeton Review’s survey methodology and criteria for the rankings, plus its detailed profiles of the schools are also accessible at www.princetonreview.com/best-business-schools. The Princeton Review has reported its lists of top schools for entrepreneurship programs annually since 2006 in partnership with Entrepreneur Media Inc., publisher of Entrepreneur magazine. Entrepreneur posted an online feature on the lists at www.entrepreneur.com/topcolleges. An article on the lists will publish in the magazine’s December issue, available on newsstands November 27. The Princeton Review also reports MBA rankings in eighteen categories as part of its annual project Best Business Schools 2019. Belmont’s Jack C. Massey College of Business’s MBA program is also profiled in that project.” The Princeton Review is not affiliated with Princeton University.